The Railway Quay looks busy too! 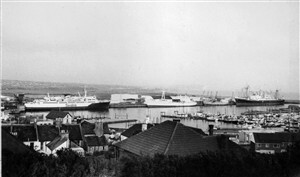 I've decided to put together a collection of 'full house' photos that depict Newhaven as the busy port it once was. Scouring the Newhaven Museum archives has turned up quite a few, and my thanks go to Peter Bailey for letting me use them in this collection. 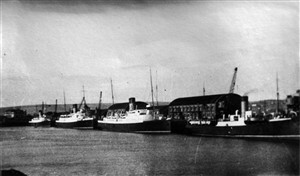 I'll try to go in chronological order, so we'll start with one from the 1930's, which shows a collection of Railway ships at the East Quay. From left to right, we see Rouen, Brighton(V), Worthing and the Dieppe 'screw' Bordeaux. Into the 1960's for the next few photos, and the first is from 1961-63. 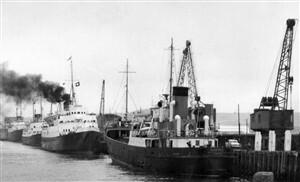 It's of the Railway Quay, with the dredger AA Raymond nearest the camera, Brighton (VI) on the gridiron and Londres ahead of her. There's a smaller vessel in front of her and I can just make out the dredger Testside in the distance. My thanks go to Richard Beckett for finding this one in the archives. The next photo can be positively dated as 1964, as it's the only year that Falaise ran with the black of her hull up to fo'c'sle level. She is at the ramp, with Arromanches ahead of her. Making a lot of smoke, and flying the 'Blue Peter' flag indicating that she's just about to sail, is Brighton (VI). Finally nearest the camera is one of the last of the three Dieppe 'screws', the Nantes. The next photo has details written on the back - always a great help! It's 9.00am on Sunday, 26th September 1964. Falaise is at the ramp (remember that she was the only car ferry on the route at that time) and Arromanches is lying ahead of her. Lisieux is moving down river, having presumably spent the night moored alongside Arromanches . I can see no passengers on her decks, so it looks like she is making a 'light' crossing - no passengers, just getting back to Dieppe to pick up her next scheduled sailing. Brighton(VI) is ahead of Arromanches. 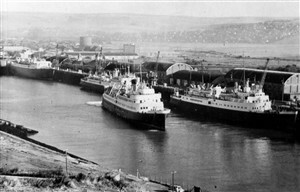 The final picture from the 1960's is unusual, in that it shows the entire Newhaven/Dieppe fleet together. It's 1965 or 1966, as both the V twins have arrived on the route but Brighton (VI) has not yet been sold. At the ramp are both Villandry and Valencay, with Falaise and Brighton ahead of them. No smoke or 'Blue Peter flags' this time. No movement at all in fact, as the reason for the assembly of vessels is a French seamen's strike, one of many that were to plague the route over the years. 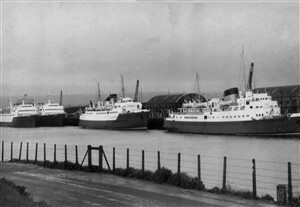 Moving into the 1970's, a photo of a busy East Quay taken by Peter Bailey and showing the car ferry Villandry, two small unidentified coasters and Shaw Saville Line's Durango. The photo is certainly post 1973, as you can see the lengthened piles ahead of Villandry. These were added to allow the larger Senlac to swing. There are still a couple of photos missing from this collection. One pictures an absolutely jam-packed Railway Quay, I can remember it, but as yet I can't find it at the Museum. Another photo is of the dredger A A Raymond at the Marine Shops by the bridge, with one ferry on the gridiron and every other berth occupied by a group of Railway ships, some 'ours' and some visitors, but all laying up for the winter. To complete my "Full Houses" I need a full complement at the West Quay of (i) fishing boats and (ii) pleasure craft. So if you have any other 'full house' photos or maybe know someone who does, please let the Museum know and they'll contact me. I'd love to include more on these pages. This page was added by Andy Gilbert on 26/11/2008. Year after year spent wandering around the West Quay as a kid, I was normally playing in 'Huggets' and I got used to all the comings and goings in and around the harbour. 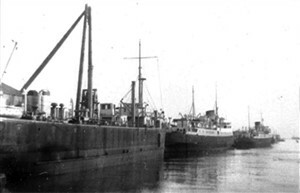 My two favourite little ships - if you could call them that - were the 'Ron Willoughway', a ballast boat which I believe was bought out and renamed 'Sand Something', and the grubby little coaster the 'Con Zelo'. They always seemed to be in Newhaven every couple of days. Apparently as a kid I couldn't get my tongue around Ron Willoughway so refered to it as 'Ron Willoughboat'. Happy days. I remember the 'Durango'. Myself and another guy called John Parkinson did a prop and rudder survey on her around 1973/4 when we worked for Mike Newton-Smith. Interesting article showing the line up of some of the old mail steamers and the new generation of ro/ro vessels initiating the car ferry service. It seems strange to think these ships ran for many years under the old Newhaven to Dieppe arrangement and in recent years there have been numerous company changes and alterations. It must be the modern times we live in, with all the ever changing pressures on modern businesses, not to mention our fast pace of life in comparison to this period.